Home » Rings » Men's Rings » One Carat Gents Band. This Diamond Wedding Band has 1.03 C.T.W. round diamonds. 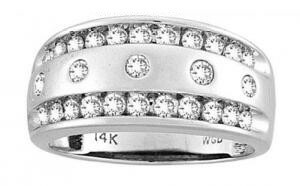 Bold look, beautiful shining diamonds, Tapered band. Band has a high polished finish.